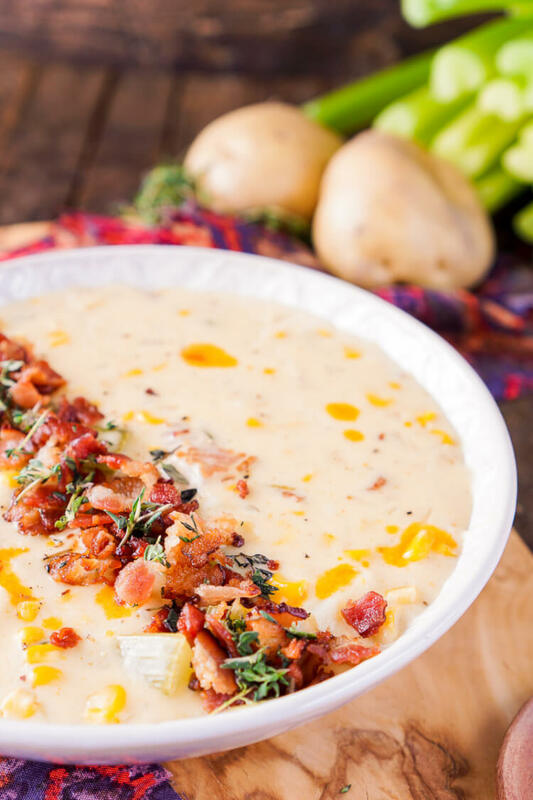 This New England Corn Chowder with Bacon recipe is a slightly spicy adaptation of the down-home classic and still creamy and delicious as ever! If there is one soup that feels like home to me, it’s corn chowder. I know most people would think that since I live in Maine I must LOVE clam chowder or lobster bisque, but that is not the case, I actually dislike both. JUST TAKE ME TO THE CORN CHOWDER RECIPE ALREADY! 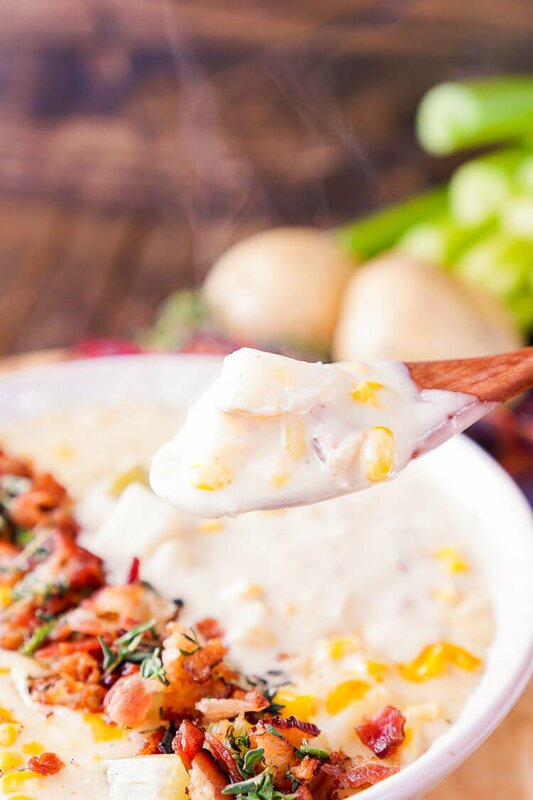 If you’d rather skip my (very helpful, I think) tips and tricks, essential cooking info, and similar recipe ideas – and get straight to this deliciously easy Best Ever CORN CHOWDER Recipe – simply scroll to the bottom of the page where you can find the printable recipe card. You see, I didn’t grow up on the coast, I grew up in the highland region with lakes and fields full of corn and potatoes. Corn Field Tag was a legit form of fun, even though this local author of ours by the name of Stephen King kept us scared out of our wits thanks to Children of the Corn. But the fear made the game all the more fun! 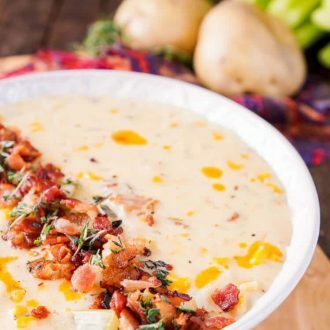 So when you grow up with a cornfield in front of your house and potato field behind it… you tend to have a fondness for the two of them, especially when they are paired together in something as delicious as corn chowder. I love the way the thick and creamy base hugs the corn, potatoes, onions, and celery. 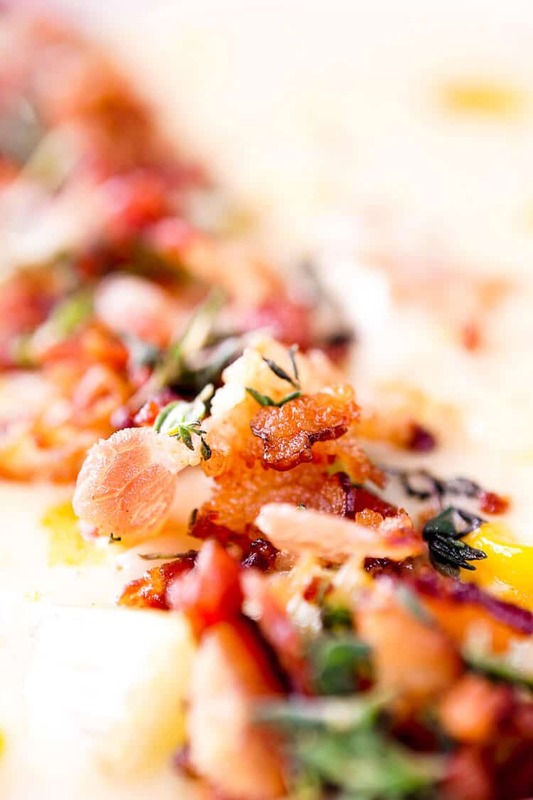 The Old Bay seasoning gives it that classic flavor we all know and love and we’ll kick it up a notch with crispy bacon, thyme, and Tabasco sauce. The slightest kick mixed with the sweet vegetables and salty bacon make for a homey recipe you’ll never want to let go of. What Seasonings Do You Use In Corn Chowder? You can use a variety of spices. In this recipe, I use Old Bay Seasoning, thyme, salt, and pepper. How Do You Thicken Up Corn Chowder? I like to thicken up my chowders with all-purpose flour, there are a few different techniques for thickening a soup or chowder with flour. In this corn chowder recipe, I like to create a roux with butter and flour and add the liquid ingredients in afterward. What Makes a Chowder a Chowder? The fact that it’s thickened by flour instead of cornstarch or another thickening agent. To most Americans, it means clam chowder, either New England with a cream base or the tomato-based Manhattan style. The term comes from the French word “chaudiere” the pot in which the chowder was cooked. The main ingredient of a chowder can range widely, from corn to clams. In a large pot, cook the bacon over medium heat until fat is rendered out and bacon is crisp. Remove the bacon with a slotted spoon and transfer to a paper towel-lined plate, leave bacon fat in the pan. Add the onions and the celery to the bacon fat and cook for 5 minutes. Add the corn and cook for another 5 minutes, stirring occasionally. Add butter and flour and cook for 10 more minutes. While stirring, add the chicken stock, heavy cream, seasonings, potatoes, and Tabasco sauce to the pot and cook for another 8-10 minutes until potatoes are tender. Ladle into bowls and top with cooked bacon, garnish with thyme leaves and drops of Tabasco. 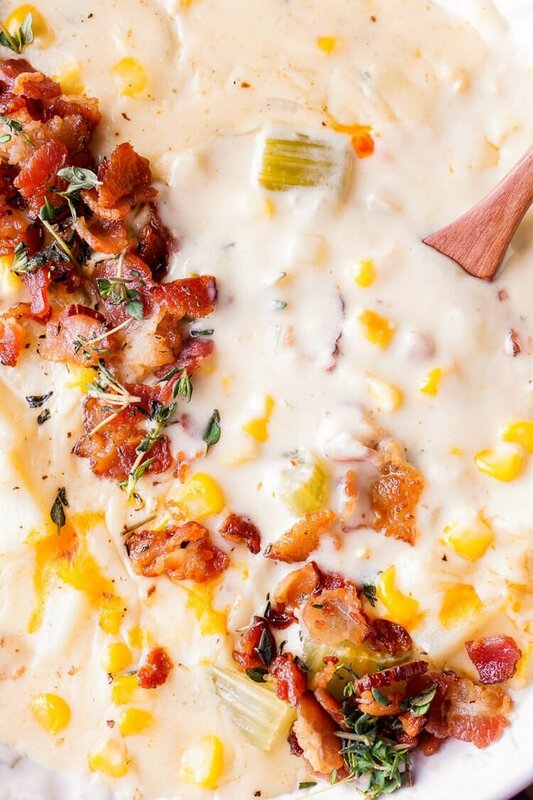 Pin this Corn Chowder Recipe for Later! 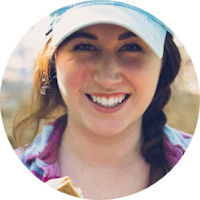 You can also Subscribe to my Newsletter so you never miss a delicious recipe again! 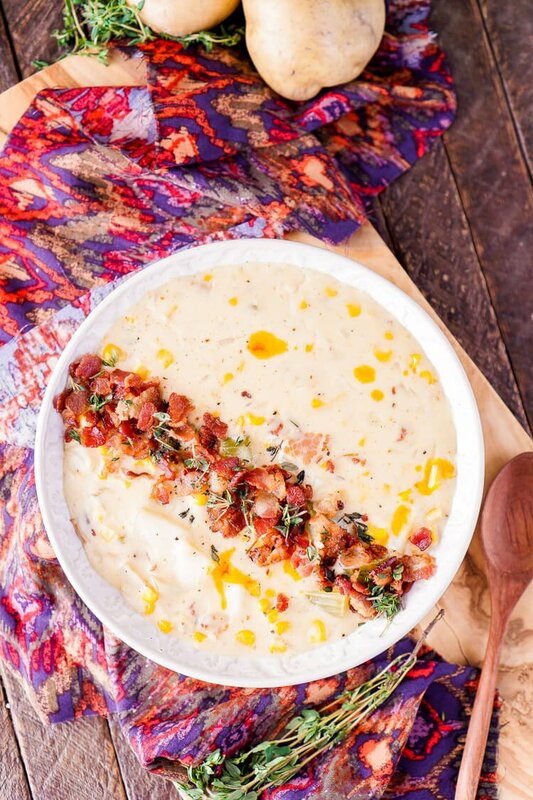 This New England Corn Chowder with Bacon is a slightly spicy adaptation of the down-home classic and still creamy and delicious as ever! EVERYTHING is better with bacon! 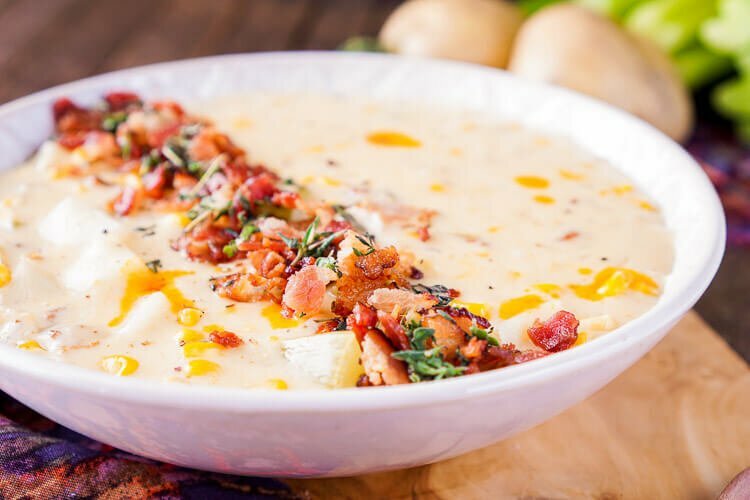 YUMMY – I’m a huge clam chowder fan, so this is something that’s totally up my alley. A great addition to a really awesome list of soups. Thanks girl! Mmm I love corn chowder! I bet the old bay seasoning and tabasco makes yours just perfect! I can’t get over your photography! Seriously…..it’s just beautiful Rebecca!! Stunning. Now I must admit, my heart sank a little when you said you don’t like clam chowder or lobster bisque!! haha. But, honestly who needs them when you’re eating a Corn Chowder recipe like this. This looks sooooo good and the instructions seem very simple. This will definitely be simmering on my stove in the near future. Thanks for sharing! Thanks so much, girl! I know, I know, it seems like a crime that I don’t eat them, right? I’ve never been big on seafood, but I actually LOVE crab! I could eat crab cakes for days!